Early Man is an upcoming British-French stop-motion animated comedy film directed by Nick Park and written by Mark Burton and John O'Farrell. The lead character, Dug, will be voiced by Eddie Redmayne. It will be released in early 2018. Set at the dawn of time, when prehistoric creatures and woolly mammoths roamed the earth, Early Man tells the story of Dug (Eddie Redmayne), along with sidekick Hognob, who unites his tribe against the mighty Bronze Age in a battle to beat them at their own game, resulting in becoming the very first game of European football. On 6 May 2015 it was announced that StudioCanal would finance the $50 million budgeted stop-motion animated film Early Man and would handle its sales. It would re-team StudioCanal with Aardman Animations and Nick Park, about a caveman who traces the world's first game of football. On 9 May 2016, while the film was in-production, the studio released its first image and revealed that Eddie Redmayne would provide the lead voice for character Dug. The British Film Institute is also a partner on the film, supporting the film with National Lottery funding. On 19 October 2016, the studio announced Tom Hiddleston had joined the cast as the villain, Lord Nooth. 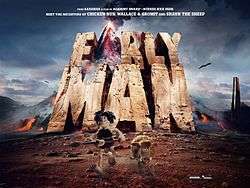 ↑ "Aardman announce 2018 release dates for 'Early Man'". Aardman. 7 January 2016. Retrieved 20 October 2016. ↑ Jaafar, Ali (6 May 2015). "Studiocanal Doubles Down On Family Fare: Reteams With Nick Park And Gilles De Maistre For New Pics – Cannes". Deadline. Retrieved 20 October 2016. 1 2 3 Ritman, Alex; Szalai, Georg (9 May 2016). "Cannes: Eddie Redmayne Joins Aardman's 'Early Man' Team". The Hollywood Reporter. Retrieved 10 May 2016. 1 2 3 "Tom Hiddleston joins the cast of Early Man, voicing villainous Lord Nooth". Aardman.com. 19 October 2016. Retrieved 20 October 2016. 1 2 Jaafar, Ali (6 May 2015). "Studiocanal Doubles Down On Family Fare: Reteams With Nick Park And Gilles De Maistre For New Pics – Cannes". Deadline. Retrieved 10 May 2016. ↑ Semlyen, Phil de (9 May 2016). "First look at Eddie Redmayne's Early Man in the new Aardman adventure". Empire. Retrieved 10 May 2016.